Is Wells Fargo & Company a Buy? A bounce-back quarter, rising interest rates, and putting distance between itself and its many recent scandals are all positives. It's also dirt cheap. North America's biggest banks have made for pretty great investments over the past few years. 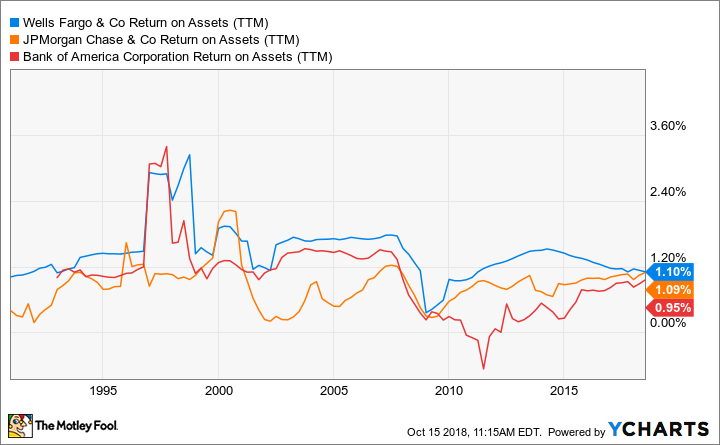 Since the beginning of 2016, Bank of America Corp. (NYSE:BAC) and JPMorgan Chase & Co. (NYSE:JPM) have delivered total returns of 72% and 75%, respectively, which is significantly better than the still-impressive 43% in total returns of the S&P 500 over the same period. 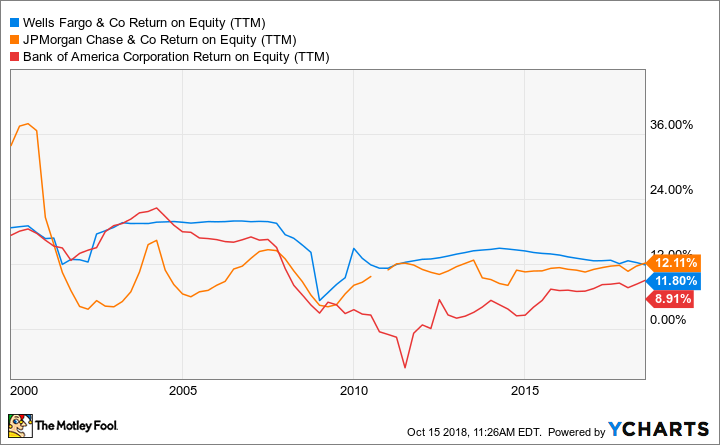 Of course, scandal-ridden Wells Fargo & Co. (NYSE:WFC) hasn't come close to matching those returns; if not for a solid dividend yielding 3% at recent prices, investors would have lost money over that period. But looking forward, is Wells Fargo a buy today? If you're looking solely at valuations, one could easily say "yes." But at the same time, unprecedented and severe penalties from regulators have the business in a holding pattern, and its reputation with both the banking public and its regulators remains tarnished. To quote a colleague who quoted yet another (anonymous) colleague, "Wells Fargo is a great bank aside from their fraud." Frankly, there's a strong case to be made for both buying and avoiding Wells. Keep reading for a closer look. WFC return-on-assets data by YCharts. TTM = trailing 12 months. WFC return-on-equity data (TTM) by YCharts. Furthermore, interest rates are rising. That should continue to be a boost for big banks like Wells, with their ultra-low-cost deposit base keeping expenses down, while higher rates will drive interest income on mortgages, loans, and credit cards steadily higher. Combine those future prospects with a return to growth in its deposit base and lending in the third quarter, and there's reason to think the worst might be over for Wells. Lastly, Wells Fargo shares are cheap by just about any metric. It trades for 13.4 times trailing earnings and 1.4 times book value -- cheap against its historical valuation, and a discount to many of its peers. At just about any time in the company's recent history, paying those multiples would make it a no-brainer for investors. Wells grew checking accounts, auto-loan originations, and business-loan originations by 2%, 10%, and 28%, respectively, last quarter -- an excellent sign that its reputation could be on the mend. But this is only one quarter removed from an ugly second quarter that saw revenue in a number of important banking segments decline. With that in mind, I don't know that it's worth jumping back in so quickly; it could be worth practicing some patience and making Wells show that the trend has well and truly been reversed. But it's not just about customers coming back to the bank; consumers can be notoriously fickle and forget about even the most egregious activities. The bigger concern is how long the Federal Reserve will keep the handcuffs on Wells and not allow it to grow its asset base. Without clarity here, it's hard to say how long Wells' management might be forced to sit on its hands at a time it should be growing: during a strong economy. The Fed handcuffs on Wells Fargo's growth is hard to ignore. In a strong economy with jobs and income levels on the upswing, Wells Fargo is missing out on an incredible time for it to grow its asset base. And not being allowed to do so might be enough to keep many investors on the sidelines. But I think between nearly doubling its share-buyback program earlier this year, and the rise in interest rates, it should be enough to pay off with earnings growth in the near term. And eventually the Fed will take the leash off its assets and it will return to growth. 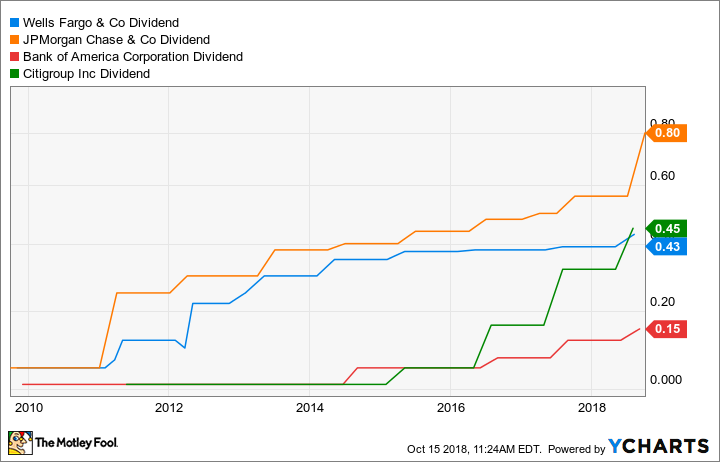 Toss in a healthy 3% dividend yield, and I think there's more than enough upside to offset the risk that it takes longer than expected for Wells to return to growth. That's especially true considering that Wells trades for valuations that historically have been considered dirt cheap -- full stop -- for the big bank. The caveat: I think it's almost all short-term risk. There continue to be signs that the economy could struggle to maintain its current rate of growth, with unemployment at multidecade lows, and rising oil prices and saber-rattling over global trade all potential threats to pushing GDP higher in the near term. And that's not even mentioning the fact that rising interest rates could already be hurting the U.S. housing market, a crucial piece of Wells Fargo's business. But for long-term investors willing to take on the reputation, regulatory, and short-term economic risks, I simply find it hard to say Wells Fargo isn't worth buying now. Personally, I'll probably wait another couple of quarters to see if deposit growth continues, but I couldn't find fault with someone buying shares today.